Abnormal enhancement involving the spinal cord or the cauda equina carries a broad differential diagnosis, but the most common etiologies include infectious/inflammatory processes versus neoplastic or granulomatous diseases. Less common causes of nerve root enhancement include hereditary motor-sensory neuropathies (i.e. Charcot-Marie-Tooth syndrome and Dejerine-Sottas disease), Krabbe’s disease and vasculitic neuropathies.1 While CT and MR findings are often complementary, MRI is the imaging study of choice when evaluating a patient with extremity weakness, paresthesias or GI/GU dysfunction. While the imaging findings are often nonspecific, a clinical diagnosis is usually straightforward in the context of the patient’s age, clinical history, CSF analysis and nerve conduction studies. However, imaging is a key component of the diagnostic workup to evaluate for the presence of nerve root enhancement, to establish an appropriate differential diagnosis and to assess patient’s for treatment response. Guillain-Barré syndrome (GBS) is an acute, monophasic inflammatory demyelinating polyneuropathy (AIDP) that is widely thought to be autoimmune in nature. More than 70% of patients report an antecedent event by 3 to 4 weeks including infection, vaccination or surgery.2 GBS is the most common cause of acute flaccid paralysis worldwide, with an incidence of 1 to 3 per 100,000 persons.3,4 Early symptoms of GBS include paresthesias of the lower extremities and low back pain which progresses to weakness or paralysis (usually symmetrically) with loss of tendon reflexes. There is typically little or no sensory disturbance.4 Onset of weakness occurs within hours to days of symptom onset and may progress for up to four weeks.4 Weakness generally begins in the lower extremities and classically progresses in an ascending manner with subsequent involvement of the upper extremities, cranial nerves and brainstem. Diagnosis is generally made by clinical history, physical exam and CSF analysis (increased protein without pleocytosis). There is no proven benefit from corticosteroid therapy and treatment options include plasmapheresis or intravenous gamma globulin with patients generally exhibiting clinical improvement by 2 months. Imaging findings classically include smooth, avid enhancement of nerve roots of the cauda equina, often with preferential involvement of the ventral (motor) nerve roots.5 Nerve roots may be thickened, but remain smooth in contour without nodularity. Additionally, there may be enhancement along the pial surface of the distal cord and conus medullaris, though the conus should be normal in size and without associated intramedullary signal abnormality. Improvement in imaging findings coincides with resolution of clinical symptoms. Chronic inflammatory demyelinating polyneuropathy (CIDP) is an acquired, immune-mediated mixed motor and sensory polyneuropathy. Patients present with predominantly motor symptoms, including symmetric weakness involving both proximal and distal muscles of the upper and lower extremities. In contrast to Guillain-Barré syndrome, an antecedent event is identified in less than 30% of patients with CIDP and symptoms progress over at least a 2 month period.2 Patients with CIDP generally show a positive response to corticosteroid therapy with variable long-term morbidity. Imaging findings include focal or diffuse fusiform enlargement of nerve roots, nerve root plexi or peripheral nerves. Both CT and MRI demonstrate abnormal nerve root enhancement. T2WI reveals enlargement and abnormal hyperintense signal involving intradural and extradural spinal nerves.5 Imaging findings do not necessarily correlate with severity of clinical disease. Arachnoiditis represents a post-inflammatory disorder of the spinal meninges associated with prior spinal meningitis, myelography (particularly with oil-based or ionic water soluble contrast agents), lumbar spine surgery, intrathecal hemorrhage or spinal anesthesia.5 While there is no distinct clinical syndrome attributable to spinal arachnoiditis, symptoms may include chronic low back pain, radicular or non-radicular lower extremity pain, as well as bowel, bladder or sexual dysfunction.6 Clinical symptoms may be seen in 6- 16% of patients following lumbar spine surgery, though radiological findings may be present without associated symptoms. Potential treatment options include intrathecal steroid injection, surgery with lysis of adhesions, spinal cord stimulation or rehabilitation. Spinal meningitis represents infection of the spinal leptomeninges and subarachnoid space due to bacterial, viral and atypical pathogens spread via hematogenous dissemination, from an adjacent site (i.e. discitis/osteomyelitis or epidural abscess) or by direct traumatic or iatrogenic inoculation.5 Time to symptom onset varies by the offending pathogen with bacterial etiologies generally producing symptoms within 24 hours, while atypical organisms such as Tuberculosis, Syphilis or fungal organisms may produce symptoms over several days. Symptoms include fever, chills, headache, altered mental status, convulsions, neck stiffness, paresthesias and gait dysfunction. Symptoms are generally more severe when associated with a bacterial etiology and overall, prognosis largely depends on causative pathogen, patient age and co- morbidities.5 Treatment includes supportive care, intravenous corticosteroids to reduce inflammation/edema, and when appropriate, antibiotics aimed at specific organisms or empirically for organisms common to certain age groups. Early imaging may be entirely normal though classically, spinal meningitis shows diffusely abnormal appearing CSF and enhancement. MR imaging findings include increased CSF signal intensity on T1WI with smooth or nodular meningeal and nerve root enhancement as well as marked enhancement of the subarachnoid space. T2WI may show areas of cord edema and intramedullary enhancement. On CT, CSF appears relatively hyperdense with abnormal enhancement of the meninges, nerve roots and within the subarachnoid space, similar to MRI. Leptomeningeal carcinomatosis may result from spread of primary CNS neoplasm or systemic tumors. In pediatric patients, the most common primary CNS tumors with leptomeningeal spread include medulloblastoma, germinoma, ependymoma and choroid plexus tumors. In adults, glioblastoma multiforme, anaplastic astrocytoma and ependymomas are the most common primary CNS sources. Systemic tumors may metastasize to the spine via hematogenous spread or direct extension to the subarachnoid space, most commonly due to breast or lung primaries, as well as melanoma, lymphoma and leukemia. Patients typically present with headache, cranial nerve symptoms, pain and radiculopathy. Lumbar puncture with CSF cytology is the most sensitive method of detecting leptomeningeal carcinomatosis.3 Prognosis is poor, and treatment generally consists of intrathecal chemotherapy and radiation. Imaging findings of leptomeningeal carcinomatosis include smooth or nodular (more common) enhancement along any level of the spinal cord or nerve roots. Enhancement patterns consist of a solitary focal mass, diffuse smooth enhancement of the cord and nerve roots, “rope- like” thickening of cauda equina and multifocal nodular enhancement.5 In the case of CSF dissemination due to primary CNS tumors, imaging should be performed prior to tumor resection as redistribution of blood products into the spinal subarachnoid space could be misinterpreted as tumor spread. Numerous pathological entities can result in enlargement and/or enhancement of spinal nerve roots. Though the imaging is often nonspecific, when taken in context of the patient’s age, clinical presentation and CSF analysis, a definitive diagnosis is often possible. When present, certain features of nerve root enhancement can help limit the differential diagnosis, including preferential smooth enhancement of ventral (motor) nerve roots in Gullain-Barré syndrome versus more diffuse irregular nerve root enhancement in the setting of arachnoiditis or neoplastic/granulomatous diseases. MRI is the primary imaging modality of choice when evaluating for spinal cord or nerve root enhancement and recognition of the varying patterns of enhancement will aid in differential diagnosis, evaluating the burden of disease and for assessing treatment response. Given CA, Santos, C.C., and Durden, D.D. Intracranial and Spinal MR Imaging Findings Associated with Krabbe's Disease: Case Report. AJNR 2001;22:1782-5. Lewis RA. Chronic inflammatory demyelinating polyneuropathy. Neurol Clin 2007;25:71-87. Atlas S, ed. Spinal Infection and Inflammatory Disorders. 4th ed. Philadelphia: Lippincott Williams & Wilkins; 2009. DeSanto J, Ross JS. Spine infection/inflammation. Radiol Clin North Am 2011;49:105-27. Ross JS, et al., ed. Diagnostic Imaigng: Spine. 1st ed. Salt Lake City: Amirsys; 2005. Petty PG, Hudgson, P., Hare, W.S.C. Symptomatic lumbar spinal arachnoiditis: fact or fallacy? Journal of Clinical Neuroscience 2000;7:395-9. Ross J, Masaryk, TJ, Modic, MT, Delamater, R, Bohlman, H, Wilbur, G, Kaufman, B. MR Imaging of Lumbar Arachnoiditis. AJR 1987:1025-32. 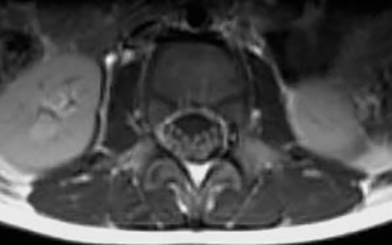 Johnson CE, Sze, G. Benign Lumbar Arachnoiditis: MR Imaging with Gadopentetate Dimeglumine. AJNR 1990;11:763-70. Zapadka M. Diffuse Cauda Equina Nerve Root Enhancement. J Am Osteopath Coll Radiol. 2012;1(1):34-37. Dr. Zapadka works with the Department of Diagnostic Imaging, Wake Forest University Baptist Medical Center, Winston-Salem, NC.